Building Energy, a multinational company operating as a global integrated Independent Power Producer (IPP) in the Renewable Energy Industry, on 4 April 2018 signed Power Purchase Agreements in Johannesburg with the South African state owned utility Eskom Holdings SOC Ltd to build, own and operate a 147 MW wind plant in Roggeveld and a 4,7 MW mini hydroelectric plant in Free State. 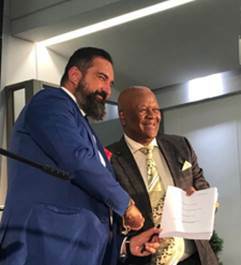 The deals were made official with the presence of South African Energy Minister Jeff Radebe and Matteo Brambilla, Building Energy Managing Director Africa and Middle East. Instead Kruisvallei small-hydroelectric plant will generate around 28 GWh of energy annually, catering to the energy needs of more than 2.330 households. In addition to covering the community’s energy needs, the plant will save atmospheric emissions of more than 23.800 tons of CO2 per year, creating more than 714 jobs during construction phase, with another 720 long-term jobs created during the operation. The projects will reduce CO2 emissions in excess of 526.700 tons and will create over 6.014 new jobs during the construction.